Beautifully furnished romantic casita, located on gated grounds, just a short walk (6 blocks) to downtown Encinitas, Moonlight Beach and train station. After a day of enjoying surf and sand indulge in the diverse restaurants, coffee houses, and shopping Encinitas has to offer. Legoland, Del Mar Track, San Diego Wild Animal Park, Petco Padres Ballpark, Gaslamp District, Old Town, Cedros Design district, and Del mar Racetrack are also just a short drive away. Bicycles available for cruising Encinitas. Onsite parking. 1 bedroom with walk-in closet, beautiful bathroom w/shower, fully appointed modern kitchen (stainless steel appliances, blender, coffee maker, iron, toaster) living room with large TV, WiFi, breakfast bar, and very large deck overlooking grounds and partial oceanview. Ideal for barbequing or or just relaxing. Fully equipped with teak eating and lounge furniture. Ceiling fans in both living and bedrooms. As of 1/1/2009 the City of Encinitas has added a 10% tax to all rentals less than 31 days for the purpose of restoring the beach sand. All proceeds go to this effort and we appreciate your support. The tax will be added to the rental rate. We bought the property when our Grandson was born in Encinitas and fell in love with the prospect of our son living in the main house and having a place for us to stay when we visit. We loved the 1940's villa main house with the unique private 1 bedroom casita over the garage. The grounds are beautiful and the area is somewhat secluded in a residential neighborhood. 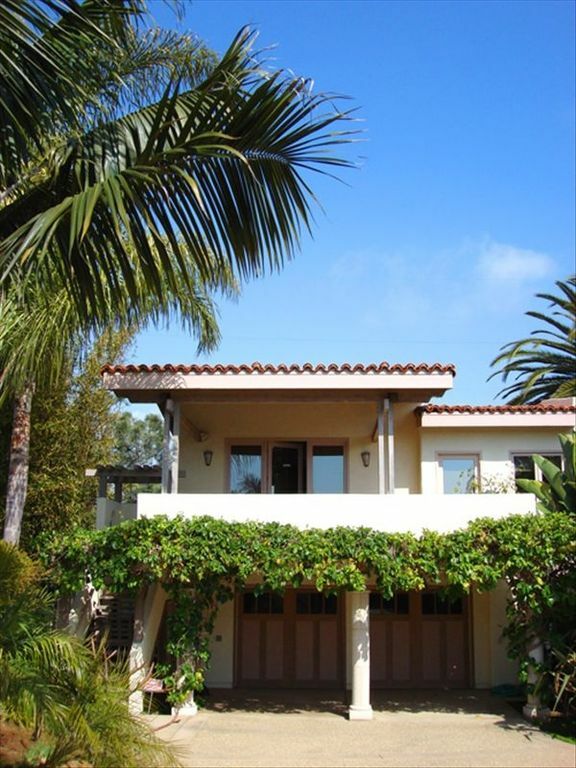 Beautiful second story Casita setting overlooking Encinitas Beach community with endless sunsets and large deck for outside activity. Walk in shower, toilet and sink with excellent lighting, &medicine cabinet. Basic amenities provided are shower gel, soap & shampoo, plus disposable make-up removers & hair dryer. "peek a boo" view through the palms and trees. No air conditioning, but ceiling fans in both rooms. Available for use in the garage. Must provide own supplies. Parking space for one car outside the main gate. Living area is roomy with sectional and additional chair. Very Basic pantry items such as flour, sugar, and some spices. All dishes and usual kitchen utensils available for most meal preparation, including baking dishes, mixing bowls, serving pieces, place mats, and of course, flatware. Fully appointed kitchen with small appliances included; ie, coffee pot, blender, mixer, cooking utensils, etc. Small dining table attached to the kitchen counter will seat 3-4. Additional dining space on the deck with teak furniture and chairs. Lots of books provided and often re-stocked by previous guests. Some games and cards are in the book case. 2 beach chairs and beach towels are available. Encinitas Ranch Golf Course is public and 2.7 miles away. Hot tub is available for use but shared by home owners. This was our first visit to Encinitas and this charming casita was lovely and felt like home. Eric was a wonderful host and very responsive to any request! The bed was soooo comfortable we forgot we were sleeping in a queen bed instead of a king. The location is close to great restaurants and the Lazy Acres Natural Food Market! Don't miss it! Moonlight Beach is just down the hill. The San Diego Botanic Garden is very close and worth a visit. You don't often find a beach rental this reasonable and so well appointed. The windows looking out over the bushes, trees and green plants makes this feel like you are in a treehouse. Love this location & the comfortable furnishings. Friendly hosts and a clean comfortable place just perfect in size for a couples getaway. Really enjoyed how easy it was to access the main roads without feeling like you were right on the high way. Eric made sure we knew our way around the place and we found the place a comfortable way to take a break from each days activities before venturing out again. Would definitely stay again! lovely and very comfortable accommodations. great location. near beach and downtown. my wife loved the gas fireplace!! Eric was very responsive and helpful when we had trouble with TV and internet. would definitely consider returning next year! Hopefully the weather will be less wet, but the ocean is beautiful in any weather. Sweet place in a sweet town. Our time in the casita was short but sweet, the home was convenient to the beach and encinitas shops. Eric was a great host, We are looking forward to coming back! All our needs were met. The Encinitas short term tax of 10% applies to stays of 30 days or less. The refundable security deposit of $250.00 is due at booking along with a signed contract to hold dates. The deposit is fully refundable after check-out if the Casita is left in good condition and it not part of the rental fees. The rental fees are due 15 days prior to check-in.